The Freightliner Cascadia Pikes Peak Special racing machine of Mike Ryan (Santa Clarita, CA) is truly like no other entry in the Pikes Peak Open division during the 91st edition of the Pikes Peak International Hill Climb on June 30. Ryan, a veteran driver, finished ninth (12:39.960) last year on the Peak in the division, but has his sights set on a higher finish this year with this amazing vehicle. The winner was rookie French driver Romain Dumas, who briefly set the all-time course mark of 9:46.181, only to see it eclipsed moments later by Rhys Millen's Time Attack triumph in 9:46.164. It competes in hill climb and drift competitions and currently holds records in both the Pikes Peak "Race To The Clouds" and the Mount Washington "Climb To The Clouds" events. The truck is equipped with a 14.0L Detroit Diesel 60 series engine with a compression ratio of 15-1 and a fuel redline of 2700 RPM. The body is constructed entirely of fiberglass and carbon fiber, even still weighing in at just over 5 tons. Like any well balanced race vehicle, it is a mid-engine design. This truck truly tests the merit of each and every one of its systems. Good acceleration requires a responsive engine, high speed requires massive horsepower and cornering and handling require extreme braking capability. At the 2012 Pikes Peak International Hill Climb, Ryan met Gale Banks, and that began a classic racing partnership of race car owner and engine specialist. The compound turbo system that the truck was equipped with was sufficient to maintain dominance in the trucks specific race categories, but it was slow to respond and allowed for too much wasted fuel resulting in heavy black smoke. Mike wanted more power and Gale is just the guy to provide it. Gale Banks Engineering has recently introduced the Straight-Shot Water-Methanol Injection System. Straight-Shot is a high-tech application of a decades-old technology. Use of water injection in aircraft piston engines dates back at least as far as WWII when it was used to increase power in airplanes allowing them to take off from short runways, climb faster and quickly reach high altitudes. In general, water injection serves to cool combustion temperatures, making it useful as an anti-detonant. This technology is especially useful in turbocharged or supercharged applications, and often allows for ignition timing to be advanced for increased performance. The addition of methanol to the water contributes an anti-freeze property as well as including a combustible fuel in the charge which further increases power potential. The Banks Straight-Shot system offers the user an unprecedented opportunity to control the injection process. In its simplest form, a user interface provides control over a pump that operates at system pressures up to 300 PSI to inject the fluid through an atomizing nozzle. Control strategy features include the ability to select injection start point and ramp rate. Input signals may include boost pressure, exhaust gas temperature (EGT), intake manifold temperature (IAT) and even throttle position (TPS). The Banks Double Shot is an expanded version which allows the addition of another stage of operation and numerous nozzles, allowing for staged batch injection or individual port injection. The system is connected through nylon pressure hose that is rated for 300 PSI. The system can be further tuned by changing the size of the nozzles; available sizes range from 0.75 to 14 gallons per hour (GPH). Pumps are available in two different ranges as well; 50 and 75 GPH. This versatility makes the tuning possibilities and potential uses virtually endless. For ultimate tunability, a Triple Shot system is available which runs two pumps for practically limitless combinations of injection control. The Freightliner presented numerous opportunities to showcase the benefits that the Banks Straight-Shot, Double-Shot and Triple Shot systems have to offer. In fact, 4 different systems are employed on the vehicle. To understand the functionality of the engine related injection systems, it is helpful to first understand the induction system on the vehicle. Prior to its visit to the Banks Power Race Shop, the DD60 power plant in the Freightliner was pressure fed from a compound turbo system; a primary turbocharger feeding boost pressure to a secondary wastegated turbo which further pressurized the air. The intake air was passed through an air-to-air intercooler before reaching the intake manifold of the engine. The compound turbo system was jettisoned in favor of a supercharger/turbocharger combination. The intent of the change was to improve throttle response for better acceleration off of the corners (of which there are many on the hill climb courses). An 8.3 liter Lysholm style supercharger replaced the turbocharger as the primary air motivator, first pulling air through a triple array of Banks Ram-Air filters. It is overdriven at 4.31 times crankshaft speed (this value is tunable with pulley combinations and may be changed during testing). Boosted air is delivered from the supercharger to the compressor inlet of a wastegated turbocharger. Due to relatively high boost pressures from the supercharger, a dual blow-off valve system is installed between the supercharger and the turbo, reducing load on the turbo compressor when it is not needed. The increased compressor inlet pressure allows the turbocharger to operate in its optimal efficiency range while delivering greater mass flow than it could with only ambient pressure available at the compressor inlet. The air charge is fed through the air-to-air charge cooler before reaching the intake manifold. Exhaust gases pass through a stainless steel equal length double wastegated TorqueTube exhaust manifold before driving the turbine wheel of the turbo charger. Although the system is capable of producing 180 PSI maximum boost pressure, The wastegate will control pressure to be to a nominal 60 PSI, holding a lot in reserve. There are 2 discrete injection systems feeding a 50/50 mixture of water and methanol into the 14.0L 6-cylinder engine. First, a Banks Double-Shot system feeds the fluid to the inlet of the supercharger through 4 nozzles, each one rated for 10 gallons per hour at 100 PSI pressure drop (in normal operation the Double-Shot system will operate at up to 300 PSI). This system has 2-stage functionality to allow for a smooth progression of flow. Triggering of the system is based on the supercharger outlet temperature; as the temperature crosses over about 120�F, a single 75 GPH pump will begin to operate at 100 PSI with one solenoid open, feeding 2 nozzles. The pump is driven by pulse width modulation (PWM) allowing pressure to be increased progressively. As the supercharger outlet temperature increases, the pump pressure will be increased to about 250 PSI, at which point the second stage will kick in feeding the second pair of injectors. Once the second stage is engaged, the pump pressure drops to allow a smooth transition in fluid delivery. System pressure will peak at 300 PSI pushing fluid through all 4 injector nozzles. After the air has been pressurized by both the supercharger and the turbocharger, another blast of water-meth is delivered by a Triple-Shot system. Six 5 GPH injectors are installed in the intake manifold, one in each individual intake runner, injecting water-methanol as close to the cylinder head ports as possible. These 6 injectors are all fed by a common manifold. In this system, triggering will occur based on boost pressure. As boost pressure exceeds 30 PSI, the system will begin to operate with one 75 GPH pump. As boost pressure reaches 40 PSI, a second pump will operate as the second stage. At the point when the second pump begins to operate, the first pump will drop pressure to develop a smooth delivery curve. Both pumps will continue to increase fluid delivery pressure up to about 50 PSI of boost pressure in the intake manifold. The two pump setup is necessary to handle the required volume of fluid delivery through the 6 injectors. The versatility of the Banks Triple-Shot Injection System allows for this type of varied use. Another Double-Shot Injection System will be used to further increase the intake air density. Air Density is increased whenever temperature in the system can be reduced. The air-to-air intercooler is a density machine that acts to cool the boosted intake air by transferring the heat as it passes through a series of finned tubes to the ambient air flowing over the face of the charge air cooler. In normal operation, the maximum effectiveness of this operation is limited by the temperature of the ambient air. By adding a spray of water to the exterior of the intercooler tubes with a Double-Shot Auto-Chiller, the intercooler effectiveness can be increased. In this case, five 14 GPH nozzles are arranged to mist the face of the intercooler with water in 2 stages, the first stage beginning to spray through 3 of the nozzles, the second stage adds the remaining two. This system will trigger based on intercooler outlet temperature, and will begin to operate at 100�F, with full operation achieved at about 150�F. Since small water droplets are more desirable in this situation than an atomized mist, this system will operate at lower pressures, not exceeding about 40 PSI. With over 10,000 pounds of mass, the Freightliner relies heavily (pun intended) on its wheel brakes to slow for the corners. The more reliable the braking system is, the more the driver can confidently maneuver through the turns. Braking reliability is a function of the heat present in the system; if heat is kept in check, the brakes can remain reliable for multiple cycles. A Banks Straight-Shot Brake Cooler system was configured to provide water spray onto the rotors for cooling when the brakes are applied. This system triggers based on brake application, and has a manual arming switch so that the driver can disable it when not at race speeds. Two pumps are used, one for each axle, with a common manifold between to provide for redundancy should one fail. One 14 GPH nozzle is used per wheel rotor. 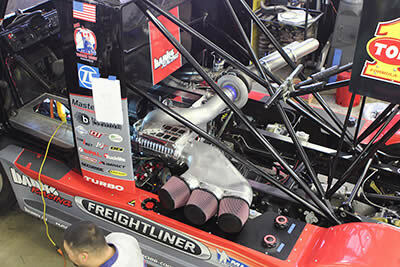 Ryan's Freightliner is an ideal platform to validate the Super-Turbo concept as well as to test the varied uses of the Banks Straight-Shot, Double-Shot and Triple Shot Water-Methanol Injection System. The potential benefits include not only increased power, but also improved fuel economy and reduced emissions. The addition of the Double-Shot and Triple-Shot water-meth systems and the Double-Shot Auto-Chiller will increase engine output by about 400 HP. The Straight-Shot Brake Cooling system will dramatically improve braking capability. Last year's time for the truck was 12:39.960. With higher straightaway speeds from more horsepower and more time at speed from improved braking, Mike Ryan's Banks Super-Turbo Pikes Peak Freightliner could easily move through each of the 156 turns on the hill a full .25 seconds quicker per turn. If all works as planned, Banks and Ryan expect to be well into the 11's (minutes, that is)! Since 1958, the legacy and technological leadership of Gale Banks Engineering™ in the automotive aftermarket is unquestioned. With its long history of breakthrough innovations (many patented) in high-performance gas and diesel engine development-including turbocharging and drive train-Banks has no rival. Today, divisions include Banks Power, Banks Technologies and Banks Powertrain. Gale Banks engines and systems are also supplied to the Department of Defense. Systems developed by these divisions not only enhance performance, but also increase engine reliability as well as fuel economy. Time and time again, Banks has proven its design, engineering and manufacturing prowess with Banks powered vehicles holding numerous national and world speed records.